Elinks is the heck of a console browser for many reasons: It is a full featured browser with few limitations, it has mouse support for following links and scrolling up and down and it has tabs like so many other graphical counterparts. And the best thing of it all is that it is so easy to use them that once you get used to them you just cannot do without. t opens a new tab. Ctrl + r reloads a tab/page. 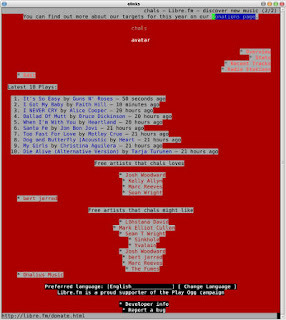 In this screenshot you can see my libre.fm page while I'm scrobbling with cmus as seen by elinks.